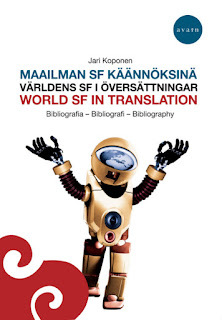 Jari Koponen, World SF in Translation: Bibliography. Avain/BTJ Finland Oy, 2012. Pp. 429. ISBN 978-951-692-944-9. €48.00. Sometimes things get lost in the mail. It happens. When the journey from point A to point B crosses two continents and the Atlantic Ocean, it is understandable that a few packages will lose their way. I like to believe that my review copy of World SF in Translation was lost in the icy, wintery sea. Or, perhaps, it fell into the hands of a lonely, SF-loving mail carrier who was too taken by the happy little robo-astronaut on the bibliography’s cover to pass it on. I will never know what happened to my lost book, but the publisher of World SF in Translation, Avain, was gracious enough to provide me an e-book copy. Whether in paper or digital format, at first glance, Finnish SF scholar Jari Koponen’s bibliography is overwhelming. Written in three languages—Finnish, Swedish, and English (with translation of the Preface by Ben Roimola [Swedish] and Elina Koskelin [English])—the bibliography is not a resource for the casual reader of SF. World SF in Translation is a text for the serious student or scholar, in particular those interested in non-Anglo-American utopian literature and SF. Once I was comfortable with the sheer number of entries (around 3,500, give or take a hundred), it was a lot of fun skimming through the book to occasionally find a familiar name and be impressed by SF’s prodigious reach across the globe. In the “Preface,” Koponen explains that the focus of the bibliography arose out of the Finnish SF publishing context, where there are significant communities of Swedish and English speakers in the country. Since there are already bibliographies addressing Anglo-American SF, Koponen excludes works from the following countries: The United States, Great Britain, Canada, Australia, Ireland, New Zealand and South Africa, as well as science fiction published in French in Canada, and translations from Danish or Norwegian to Swedish (unless there also is a Finnish and/or English translation available) (40). Even with the exclusion of these particular countries, World SF in Translation delivers on the promise of its title: over 50 countries, from Italy to Zimbabwe, Singapore to Mauritius, are represented in the 429 page bibliography. There is also a section for “Multinational anthologies and magazines,” which I think is an important inclusion given SF’s rich history with short genre publications. Before wading into the bibliographic listings, it is essential that the reader begin with the preface. Koponen carefully lays out his rationale for indexing SF works in translation, stating that: “Translation bibliographies are important tools when identifying influences that cross the language boundaries. Few people master several languages in addition to their mother tongue, so the bibliographies allow the science fiction enthusiasts to seek and find things to read” (39). He quickly sketches out the generic parameters he followed for what he includes as utopian literature or SF (basically, fantasy and horror are left out, as well as literature that involves more surrealism or magic realism than science). Most important to note in the preface, however, is the explanation of the how texts and authors are listed. While too detailed and unnecessary to get into here, I will say that Koponen’s organization of the material is logical and consistent. The bibliography itself is sectioned by country, so knowing the nationality of the writer you are interested in helps. Thankfully, if you are uncertain, as some writers are émigrés or do not write in their native language, Koponen provides a comprehensive index by author name in the back of the bibliography. The primary language of the bibliography itself is English, with any Finnish and Swedish name forms cross-referenced in English. Since all lists need a starting point, Koponen cites Somnium by Johannes Kepler, from 1634, as the historic jumping off point (41). Fleshing out the research basis of World SF in Translation is a listing of “the most crucial bibliographies that also contain information about the translations” in the “Preface.” Readers and researchers new to the field of bibliographies and translated SF works will also find Koponen’s brief discussion “Samplings of the history of translations” useful in their own studies. As an SF scholar with interest in reading a wide variety of SF writers, I am already looking forward to using World SF in Translation in my research. Since academic journals and conferences often organize around specialized topics (e.g. South American speculative fiction), I feel like I can more confidently step outside of my comfort zone of American and Canadian SF. Koponen has created an excellent, accessible resource for any scholar interested in the notable SF writers of the non-English speaking world. As a fan, of course, I am simply excited to discover entire bodies of writing that I didn’t know existed. I have wanted to learn more about Lithuania (the native home of my maternal grandmother), and now I can track down The traveller (1996), a collection of short SF stories by Lithuanian fans. The bibliography offers many possible paths of discovery. Overall, World SF in Translation is a valuable resource for scholars interested in expanding their research scope or familiarizing themselves with non-Anglo-American utopian literature and SF in translation. I must admit that, four months on, I am still a little sad that my hard copy of the bibliography never made it to me. While the e-book is a wonderful resource that I will turn to again and again, I would have enjoyed the opportunity to lug out the (what I imagine must be) hefty book and flip to a random page. I certainly appreciate Koponen’s dedication and resourcefulness in compiling this volume, and I hope that it finds a home in libraries around the world. As I discovered this past week while at a conference on fantastic literature, World SF in Translation can be useful for writers/editors/publishers looking for translators. I recommended Koponen's bibliography to several writers who are on the look out for non-English translators.